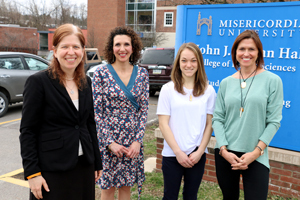 Misericordia University junior speech-language pathology major Jenna Reed of Fleetwood recently was awarded the Northeastern Speech-Language-Hearing Association of Pennsylvania's (NESHAP) Undergraduate Scholarship Award at the spring workshop in Schnecksville. The competitive scholarship award is open to students attending Bloomsburg, East Stroudsburg, Marywood and Misericordia universities. Students were required to submit two letters of recommendation, an essay that addresses one of three subjects, and various information related to the field of study. The daughter of Steven and Lori Reed has been an active participant in her education at Misericordia University, serving as the president of the National Student Speech-Language-Hearing Association (NSSLHA) and as a student research assistant. During that time, she also has presented scholarly research at the Pennsylvania Speech-Language-Hearing Association and American Speech-Language-Hearing Association conventions. NSSLHA also recognized her dedication to the field of study by naming her the Pennsylvania Student State Officer for the national organization. That drive, determination and sensitivity, Reed acknowledged, was shaped by experiences during different periods of her life, including an adult aunt with special needs, a young boy with autism spectrum disorders, and the hardships experienced by clients. For more information about the five-year, Master of Science degree program in speech-language pathology at Misericordia University, please call 570-674-6400 or visit www.misericordia.edu/slp. Misericordia University junior speech-language pathology major Jenna Reed of Fleetwood, Pa., was awarded the Northeastern Speech-Language-Hearing Association of Pennsylvania's Undergraduate Scholarship Award at the spring workshop in Schnecksville, Pa. Faculty mentors, from left, Kathleen Scaler Scott, Ph.D., CCC-SLP, BCS-F, associate professor; Melissa A. Alunni, M.S., CCC-SLP, clinical supervisor, and Lori Cimino, M.S., CCC-SLP, assistant professor, pose with Reed, third from left, after she received the scholarship award.